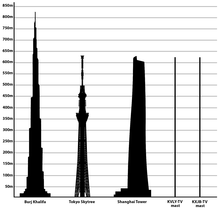 Tallest Structures in the world. The KRDK-TV mast is a television transmitting tower in Traill County, North Dakota, United States. At 2060 ft (628 m), it is the fifth-tallest structure in the world, shorter by 3 ft (1 m) than the KVLY-TV mast, which stands 5 miles northeast. Located 3.5 miles (6 km) northeast of Galesburg, North Dakota, it was completed in 1966, to replace the station's previous mast, a 1,085-foot (331 m) tower 15 miles (25 km) northeast of Valley City, North Dakota (or southwest of Pillsbury) which was sold to KOVC, an AM radio station. The antenna transmits at 100 kW for KRDK-TV (formerly KXJB-TV) of Valley City/Fargo; the station and tower are owned by Major Market Broadcasting. The mast has fallen and been rebuilt twice. The first collapse occurred at 9:08 A.M. February 14, 1968 when the rotor of a Marine helicopter severed some guy-wires; all four aboard the helicopter were killed in the mishap. The television station was off the air for eight days, finally resuming broadcasts from their previous (KOVC) tower. A replacement mast of the same height as the one destroyed was completed in four and a half months. The second mast fell during an ice storm which hit the area on April 6, 1997, subjecting it to wind gusts of 70 mph and causing at least four inches (100 mm) of ice to accumulate on the structure, resulting in the structure's failure at 6:09 P.M.. Cable programming was resumed by 8:34 and broadcasts by 3 P.M. the following afternoon through coordination with other affiliates; a 735-foot (224 m) temporary tower was completed and resumed broadcasts by July 10. This tower, known as KXJB-TV Mast 2, still stands next to the full-height mast. Work began on replacement of the full-height mast with a more durably-built structure on April 1, 1998, and had reached the tower's previous height by July 30. That day members of the construction crew affixed a four-foot (1.2 m) flagpole to the top of the tower, making the structure's height effectively 2064 ft (629 m), or one foot higher than the KVLY mast (the flagpole was later removed). Broadcasting for Channel 4 was switched to the new mast on August 15. Wikimedia Commons has media related to KXJB-TV mast. "Listing 1038731". Antenna Structure Registration database. U.S. Federal Communications Commission. This page was last edited on 2 February 2019, at 08:00 (UTC).